Kingston Frameworks Gallery & Workshop has been locally owned and operated since 1982. To better serve you, we have two Kingston locations with friendly, knowledgeable staff members. We pride ourselves on prompt service. 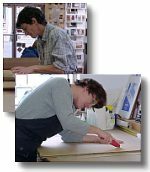 We offer a wide selection of frames and services for your custom framing needs or do-it-yourself projects. We offer drymounting, plaque mounting, large format laminations and on site consultation for residential and commercial jobs. Fax: (613) 546-9443 745 Bayride Dr.